Create your best work, faster than ever before. Mercury Accelsior Pro Q offers ultra-fast PCIe storage to take your creative workflow to the next level. Step up to the fastest Mac Pro you've ever experienced - With phenomenal data speeds up to 1947MB/s, Mercury Accelsior Pro Q makes high-demand creative tasks a breeze. Mercury Accelsior Pro Q delivers a gigantic speed boost to virtually any system. Streamline your workflow and say goodbye to frustrating render wait-times, dropped frames and spinning beachballs. With this much bandwidth, you can preview, render and process files at full resolution, in real-time. The bottom line is you create much more and wait much less. The Mercury Accelsior Pro Q installs easily into compatible Mac Pro models (PCIe 2.0 x16 slot recommended), or into the OWC Mercury Helios. Download the driver and you're up and running in a flash. The Mercury Accelsior Pro Q is proudly designed in Austin, Texas and undergoes a rigorous 7-stage testing procedure including 100% burn-in, resulting in unwavering dependability. We back the Mercury Accelsior Pro Q with a full 3-year limited warranty and OWC's free USA-based lifetime support. Auxiliary power cable required for use in the Mercury Helios. Not compatible with OWC Mercury Helios 3. Benchmark testing conducted in March 2017 using a 2.93 GHz Quad-core Intel Xeon Mac Pro with 32GB of RAM and a 960GB 3G SSD. Testing conducted on a OWC Mercury Accelsior Pro Q PCIe SSD with 480GB of flash memory. 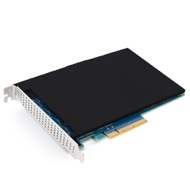 This PCIe device was installed in the PCIe 2.0 x16 slot. QuickBench 5.0 Extended Test was performed using 10 cycles, with 'Asynchronous I/O' and 'Allow Cache Effects' disabled. Black Magic Speed Disk Test (version 3.0) was performed using the 5GB 'Stress' setting. AJA System Test (version 10.3.3) was performed twice: the 4K (4096x2160 10-bit RGB) 'DiskWhack' test with a 'File Size' of 16.0 GB, and the 1080p (1920x1080 10-bit) 'DiskWhack' test with a 'File Size' of 16.0 GB. [AJA 'Streams' test results depict 'Frame Rate' settings of 23.98, 29.97, and 60 frames per second.] Results represent the extended test average. Bracket not included in measurements. The "Width" measurement refers to the card's thickness. 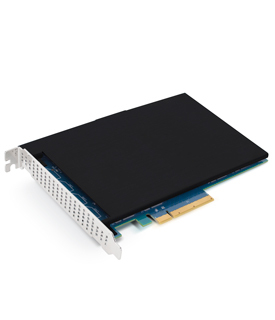 Notice: currently the Accelsior Pro Q is approximately 4 mm out of spec for a Full Height PCIe card. For this reason it may not fit in some PCIe expansion chassis.